you need the factory, if something goes wrong..
this is a short comment on an older model, which was completely refurbished with the newest dac (24/196) and a new cdm pro at considerable cost. The refurbishing was not easy, as a hum and later a complete stop, made a complaint necessary, which turned out to be a problem of the new dac, however, that should now be resolved, so nobody else (hopefully) encounters this problem. In fact, the hum mentioned in another review is virtually nonexistent in mine (if you go really really close..). Sound is great, although I can only say it is the best I ever heard, does that tell you anything, as I have not heard dCS or Meitner, which is what it should stand up against, if you would buy it new, which I havent. we had a problem, they solved it, what more is there to it. Outstanding look and feel. Great resolution and silky tone. Unique in the top high end range conerning earthy tone and space. My recommendation if you own a 20 Bit ZZ-Eight: yes, do the upgrade to 24 Bit. If you want to buy a high end player: Try the ZZ-Eight. There is only one thing I don’t like with my Bow. The ZZ-Eight uses two transformers, one for the drive and one for the converter. Since there is only little room in the cabinet the typical conventional transformers (with blue plastic cabinet) are mounted directly on the circuit board. I don’t like transformers being mounted directly on the circuit board. The vibrations of the transformers are transmitted to the circuit, where microfone effects will – or at least can - harm the sound. The two transformers of my Bow produces hum that is audible close to the player. Audible hum is an indicator for vibrations. A perfect solution would be an external power supply using huge toroid transformers being isolated from the power supply cabinet. If Bow would offer such an upgrade I would buy it. This criticism don't prevents me from rating 5 stars. I bought the Bow ZZ-Eight in 2002 second hand. In December 2006 I ordered the upgrade to 24 Bit DAC. It was not changed since the player entered the market 1996. A good decision. The design is puristical, elegant and really timeless. Announce the Bow to people not knowing the product history as a new release: they won’t doubt it. Perhaps the Bow one time will be one of the few Hifi products which will be in production over some decades with an unchanged cabinet. I hope so: the metal of the case is really fun to touch, the switches of the case and the remote are outstanding concerning build quality and ergonomics. The weight of 16 Kilogramm indicates that it is build for eternity, it also may be the reason for the special sonic qualities I describe below. What technology do you get with the upgrade to 24 Bit DAC? I opened the cabinet and saw a beautifully designed SMD circuit board fully packed with quality components. The two PCM1704K 24Bit D/A converters I detected were no surprise. But I also registered two Analog Devices AD797 op amps in the output stage. The initial 20Bit DAC used two Analog Devices AD744. The AD744 cost around the half of the AD797, so it seemed to me that also the analogue output section was improved. In my opinion the analogue output stage is as important as the converter (in another component I replaced the OPA134 op amps by OPA627 with significant sonic improvements). All other components I detected kept the high quality level, e.g. Wima capacitors and Panasonic FC capacitors (which replace the Elna capacitors of the previous versions of the 24Bit DAC). My upgrade package also included a replacement of the Philips CDM12 Pro drive to the newer CD2 Pro. The drives look very similar. The functional advantages of the CD2 Pro drive I detected were a quicker spinning up time and a quicker skip between titles. Copy protected CD’s which the CDM12 didn’t play were no problem for the CD2 Pro. So far I have found no CD in my collection, where the Bow skipped because of CD bugs. The CD2 Pro is used in many of the top loader high end players (e.g. Burmester). The sonic quality let you forget the money you spend for the upgrade. The upgraded Bow has a level of resolution as well as a silky and smooth tone which the initial model did not have. The difference concerning these criteria are clear, not subtle. The resolution and tone is as good as the best high end players you can get. I prefer the sonic profile of the Bow to other high end players because of two more sonic attributes. The Bow sounds earthy, a character I often miss when hearing CD with other components. A character I usually don’t miss when playing vinyl. Secondly the Bow is unique building space: singers and musical instruments gets concrete, you think you can grab them. A feature also many audiophiles – and I – usually associate with high end analogue gear. I assume that the construction of the Philips drive embedded in a bulky cabinet causes this trait. But I have no proof for this assumption. Bow made a strength out of a weakness. In the past customer communication und period for doing upgrades of equipment were below average – at least in my perception. And now? Bow did my upgrade during December 2006 and I am enthusiastic. Excellent communication - even about the progress of the upgrade in Denmark, great shipment service with TNT, fair clearing of special requests, perfect technical work. Absolutely above average. Big compliment to Bo Christensen and Lars Nygaard Moltke. I am a lucky owner of a ZZ-8 cd player since 2002. I agree with all enthusiastic reviews about 2002 standard edition. Now, since several days, my ZZ-8 returned from Bow's Factory upgraded with the new 24bit/196khz DAC board. The cost was no low (1600 eur plus freight) but sound's improvement is great. All soundstage's aspects are very enhanced and above all fluency, "fullness" and richness of each note. Now in my opinion is one of the top very-high-end cd pleyers in the world. I took a chance buying this product, it was 8 years old, expensive, and from a manufacturer I was unfamiliar with. But I'm glad I did take that chance... The zz-Eight is fantastic! It does so many things well, and nothing wrong. It has had its bass tuned to be extended - at first I thought it was too much, but now, well, it just seems so natural. It can pick out minute detail, but it always presents it to you as if you always knew it was there. It's very easy to listen to. The word organic is used too much to describe hi-fi, but thats just what this is, very organic and natural. I found my foot taps a long to everything I play; this machine brings out the soul and emotion in everything. A point sorely missed in my last cdp - Meridian 588. I can categorically say, this is an amazing machine. Not to mention it looks like Knight Rider / Sci-Fi creation. I am very proud to own it. It can be uprgaded to 24 bit, but to be honest, 20 bit is enough. I'm really happy. You should take a chance on this little known machine too. This review is of the Bow Wizard 2 CD as it has no separate listing, it is is similar to the ZZ-Eight. I have been completely won over by the musicality, dynamics, styling and build-quality of this machine. Previously used a Primare 30.2, and the Wizard 2 is far superior - have absolutely no regrets and see it as a major upgrade. Renders all kinds of music beautifully, and particularly good with modern jazz, classical baroque and vocals - no harshness or sheen - but perfectly balanced between detail and warmth, combined with 3D soundstage so that every instrument has its presence. Heard a great deal of detail missing previously. Also superb original design and build quality - and lovely remote ('The Wand'). I remain to be convinced that I'll find a better machine in or near this price range. Quite hard to get hold of - but well worth looking for. Bow Technologies have a good website with helpful reviews - and they are an intriguing small company. Primare 30.2; various Marantz, Arcam, Musical Fidelity, Naim, Meridian, Linn, etc. My system: Power Amplifier BEL 1001 MKIV Pre Tone Audio TVC Speakers Vandersteen 2Ce Interconnects Logical Cables Blue Diamond and Logical Cables Platinum One Speaker Cable Logical Cables The Snow (2 x bi wired) Power cables Logical Cables Diamond Mirror Outlets Hubbell in 02 phases with dedicated lines Bow ZZ8 is the best CD player I ever heard. Very musical with perfect timing. A lot of information near to analog mantaining correct tonal balance and soundstage very detailed. The bass... The bass are very detailed, tight and musical. ZZ8 is simply fantastic and combined with High End cables could get impressive results. If you want to here music, like the music is, for many years, ZZ8 is your choice. Attention with the interconnect and speaker cables that should be the best as possible to leave Bow ZZ8 show their qualities. The most musical CD Player (Or DAC) that I´ve heard. Nothing compares to it in terms of musicality. NOthing. Put a lot of air around the musicians. It not puts the musicians in your room. It put´s you inside the record room. timbre, control - yet flowing, musicallity, presentation, smoothness, "body" on all instruments, build quality, design, optional "Wand" remote control = very beautiful. Perhaps deep bass control, poor quality of standard remote. Wadia's speed. This integrated cd player sounds a lot different from most players on the market. The only ones that comes close are the CD12 by Linn and Wadia's big models. The ZZ-8 has a great presentation of the music reproduced; music has more body, soul and spirit. Musicians stand infront of you in full size flesh and blod, but the distance between you and the presenters are farther than normal, a thing you love more and more for each day you live with the ZZ-8. Suddenly your friends' systems sound boring and lifeless, and you smile every time you play your own system. My player has been slightly modified for great improvements to follow: My player has 8 pcs 1702-K, I2S-digital bus (optional upgrade, not standard), LC Audio XO Reference clock (jitter reduction) and new op-amps (AD825). 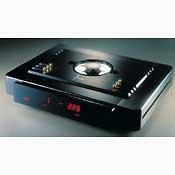 If I ever should replace my ZZ-8, it would be with Wadia's 21 or 16 model. I've only heard the 21 of those two, but I liked the 21 better than the 850 and owners of the 16 state that it is far better than the 21. Linn's CD12 is also great, but much too expensive. But I've lived with my ZZ-8 for 3½ years now, so I think it stays - it's just too good!!! I've tried a lot of cables in my system and have finally setled with Kimber PBJ and 4TC after having tried: Purist Audio HDI & Elementa interconnect and speaker cables, Argento silver cables, Supra 3,4 and EFF-1, Kimber KCAG & 8TC, MIT Shotgun cables, DIY Silver cables, DIY litze cables. I Highly recommend the ZZ-8 to anyone who loves music! Bo Christiansen , the ZZ-8's designer sad that he used his ears when creating the product. His ears must be damn good for the Bow is indeed a very good CD player. But his eyes must be better. Indeed, I haven't come across a better designed CD player in the market. The design is quite futuristic much like a square-shaped flying saucer suspended in space. And space there is even in the musi. For all lovers of analog, it is tough to find a better match. It has a very dee and well layered soundstage with instruments well delineated. The vocals are not aggressive and don't hit you in the face as in some players, but are more relaxed and stay a bit behind, allowing one to be drawn into the music. Bass is tight and deep. All in all a very musical layer. Agreed, that it is a bit pricey but it is still worth it.